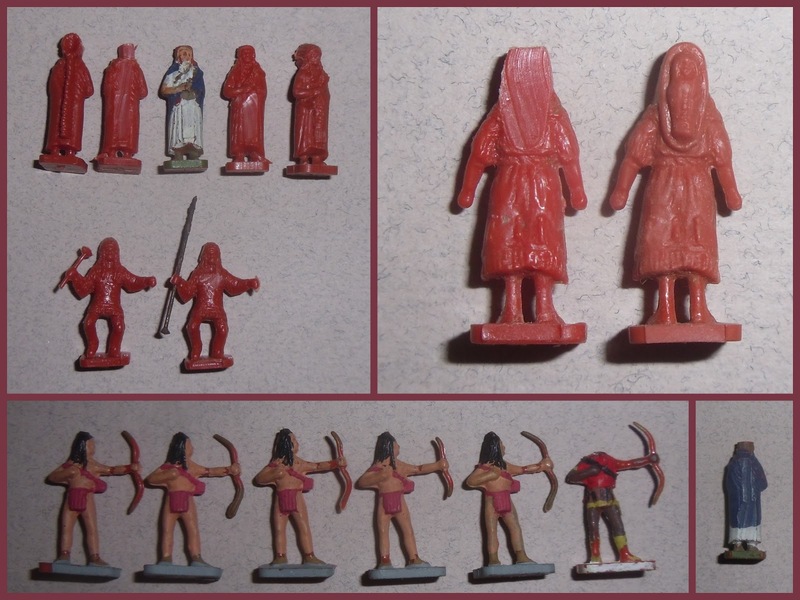 Very poor on pose numbers and no accessories (Tipis/Tee-Pees, canoes, cooking pots etc...) made this a serious disappointment as a set, but it has it's uses and they could paint-up well. 1975 Catalogue shot sent-in by Kostas a blog follower from Greece, very atmospheric; this was one of my favourite artworks as a kid, these guy's are just about to go-off and give the '7th' a lesson they won't have time - on this Earth - to forget!! 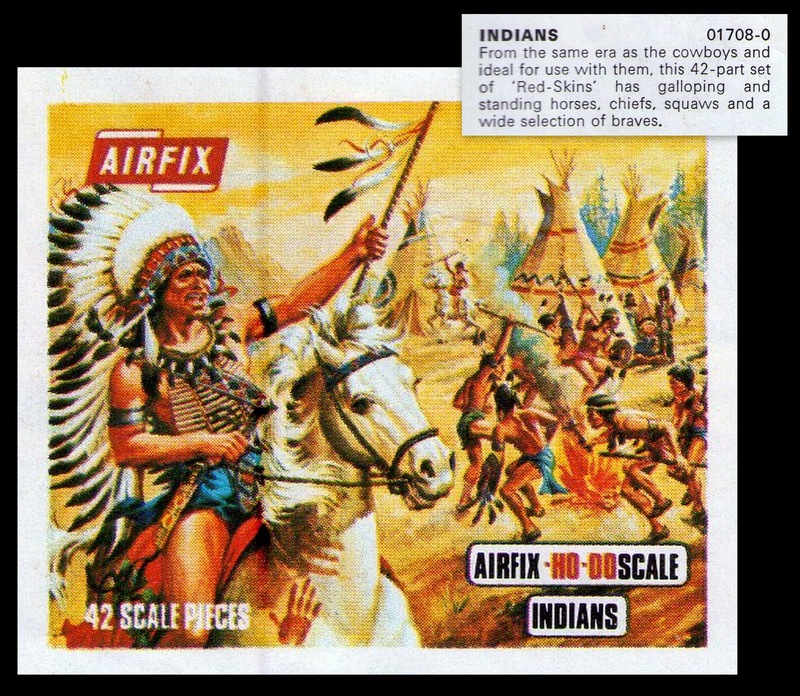 1990's fort play-set re-issue bagged set in a new colour...'Red' Indians...gedditt?!! There's something slightly racist about this particular Heller-Humbrol issue...or am I being over sensitive here? 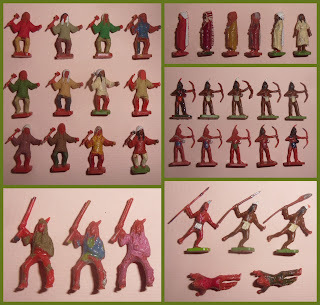 The full set laid out by pose, this was a very disappointing set back in the day, but seems to have sold well, due - in part - to the fact that they made very good skirmishers in many an early war gamers 'Ancient' army. Horses were as per the Cowboy set but with minor changes now looked at below The same horse was used with the first version Foreign Legion. 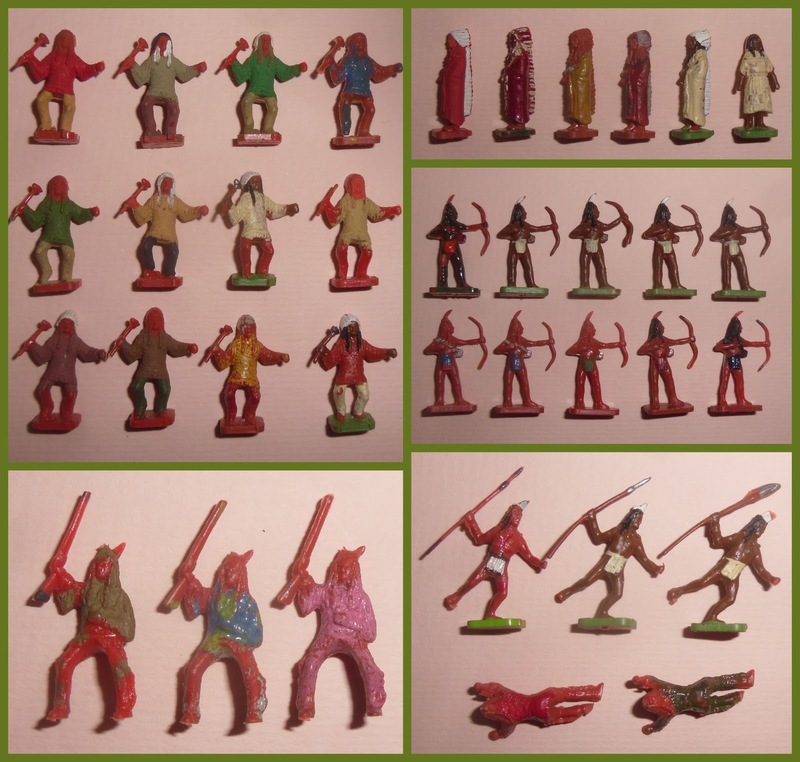 Early sets were in a proper 'red-skin' colour (far left), these are getting quite brittle now, they then adopted the 'budget' red-oxide brown-red of various sets in the 1970's before the hideous scarlet of the 1990's release. Some figures who have been mucked-about with. 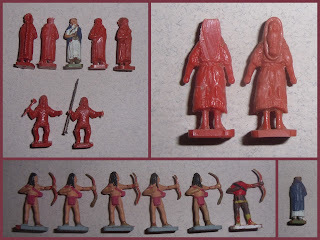 The gang at the bottom are five of my 'Egyptian' archers, given a 'uniform' and mounted in chariots they looked quite business-like back in the 70's - simple removal of feather head-dress. The other figure is someone else's attempt at what I think is meant to be a Carthaginian. Removal of head-dress leads to Roman civilian patrician (blue and white figure) wandering down to the forum, while removal of baby and papoose gives a variation of the female pose. The other is a standard - Terry Wise school - wire spear, also with head-dress removed. 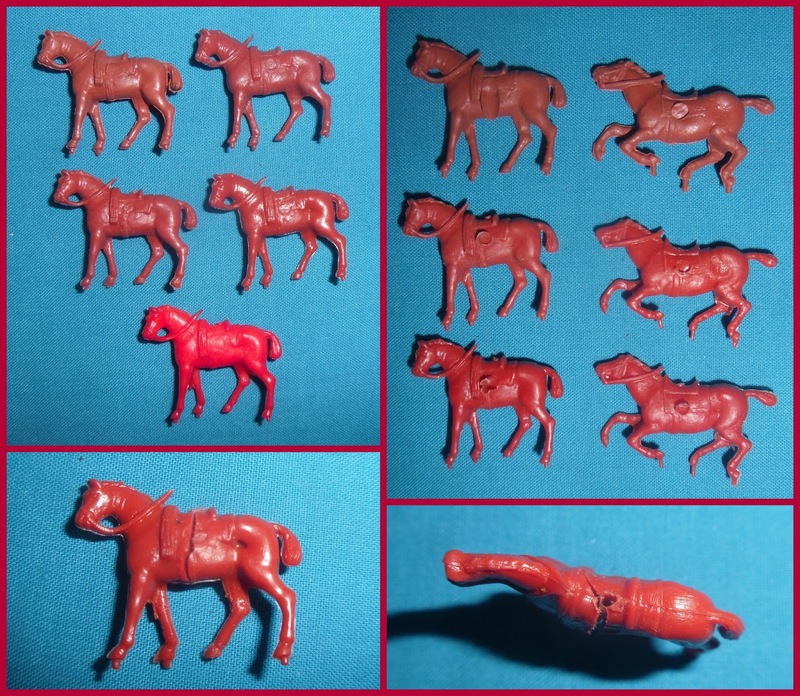 Horses and colour variations, the two close-ups at the bottom show what pin or wire conversions do to old 'on the way out' plastic, time and pressure slowly part the long-chain polymers and in the end the whole lump fails. 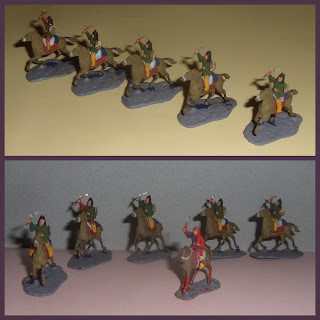 More of my ancient (pun intended) Egyptians, the chap on the Indian horse used to have a little card shield glued-on, the axe-men were given my favourite US Cavalry horse, not favourite for pose - particularly - but because it was easier to get to stand up than some of the other horses. Again, just feather removal and a uniform paint-job. OBE's, all just splash and dash with a bit of paint in the stab-and-hope style! Gloss pink, gloss green, gloss blue...they're so 'old school' is a pleasure to show them! More colour variations, the very early ones to the left are a grayish-brown, matted plastic, prone to brittleness now (added chalk for paint adhesion), they get glossier through the 70's as chalk is replaced by more modern lubricants and then we get to the awful red of Heller/Humbrol. 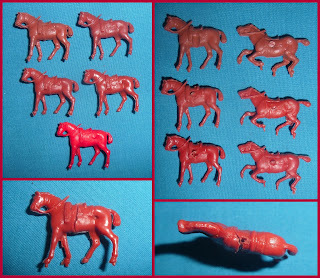 Indian horses on the left with the cowboy versions on the right, the saddle-roll of the standing cowboy mount are missing from the Indian version, with horse given a blanket over the shoulders, the running horse loses it's water-bottle/feed bag? Fight to the death; "It's him or us!" "Heap big'um monster" as Little Plum might have said in The Beano! 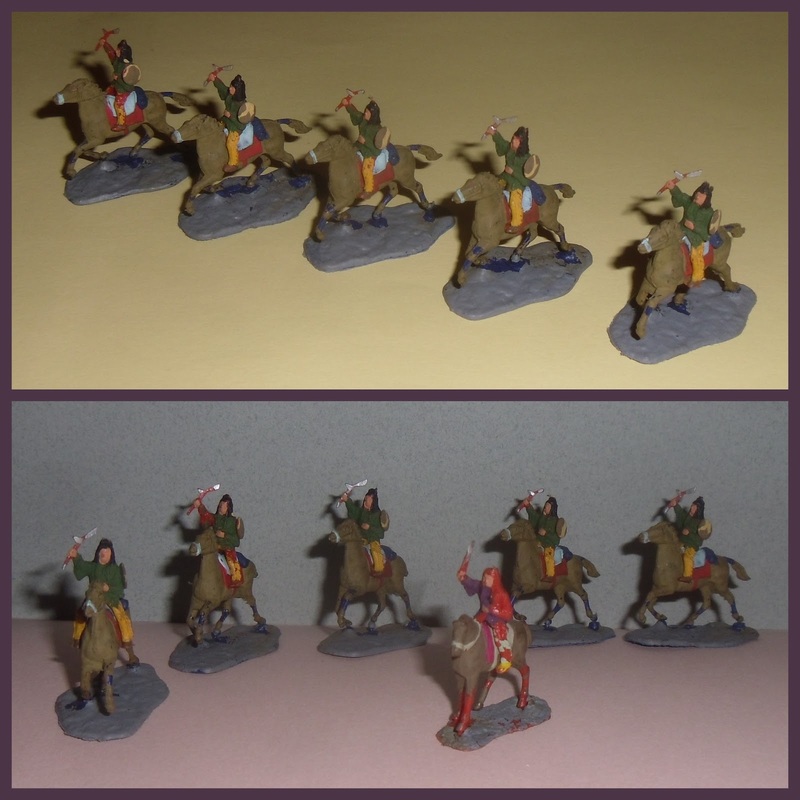 Montaplex/Hobbyplast sets, wagon-raid on the left, straight duke'ing it out with twice the figure ration on the right. These are really quite poor figures, even by Mantaplex's standards! Both actually badged to Hobbyplast. 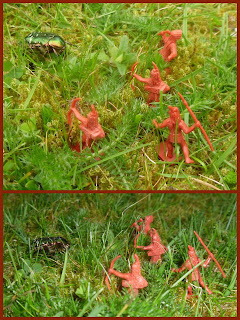 Side-by-side comparison with the figures in the previous image and the Airfix 'donors'! 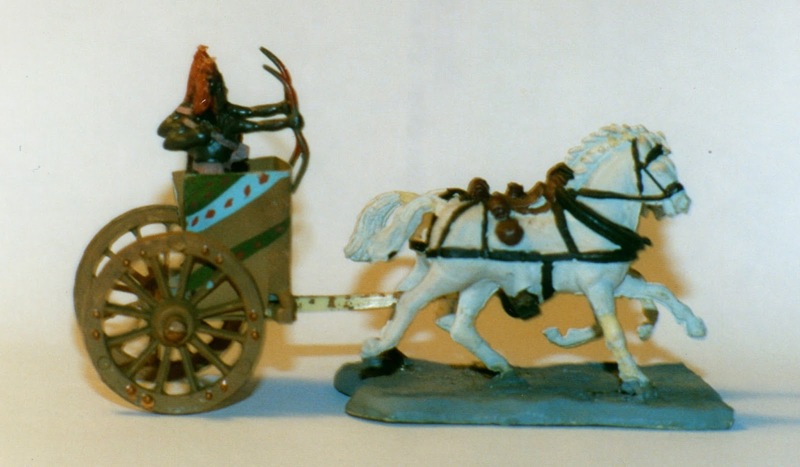 The Hobbyplast figures are 24-carat shite, but the horses - with their integral bases - are bloody useful! Size comparison between Airfix and various Walter Merten examples, including a Hong Kong piracy on the far left of the line-up, the Airfix is fine with the commoner Merten's, a little bigger, but that is mostly base, but he's noticeably larger than the two on the right who are from another set. The HK figure seems to be a melding of the two poses to his right, but my catalogue in in storage and it may be a stand alone pose in its own right? 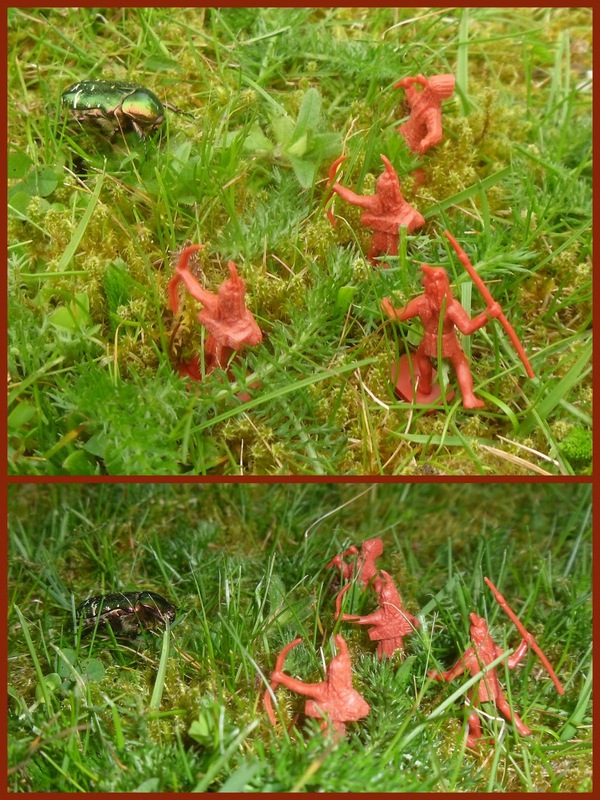 The very useful accessory from the range of polystyrene forts Airfix produced for the HO/OO figure range to garrison and fight over. 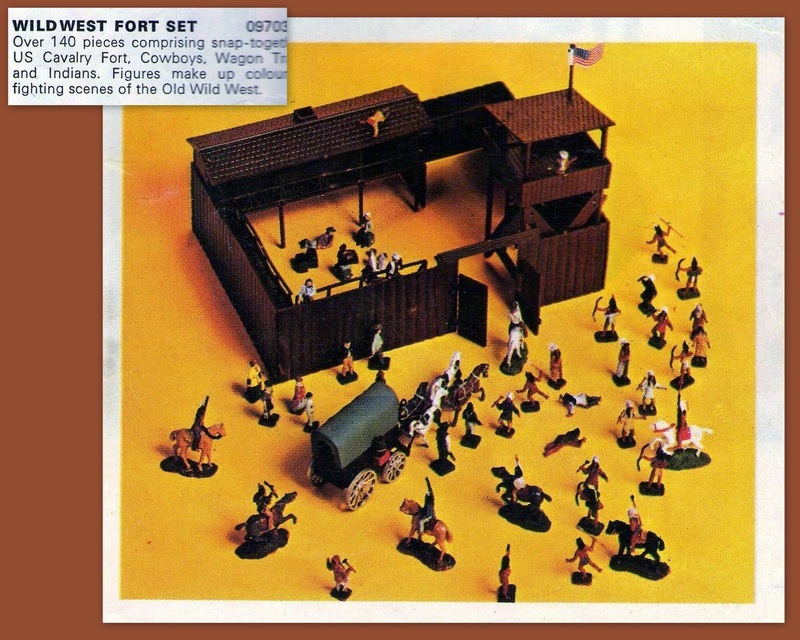 This is a 1985 catalogue shot - courtesy of Kostas again - of the larger Wild West Fort Set that came with a full set of Indians and the Wagon Train for them to prey-on. 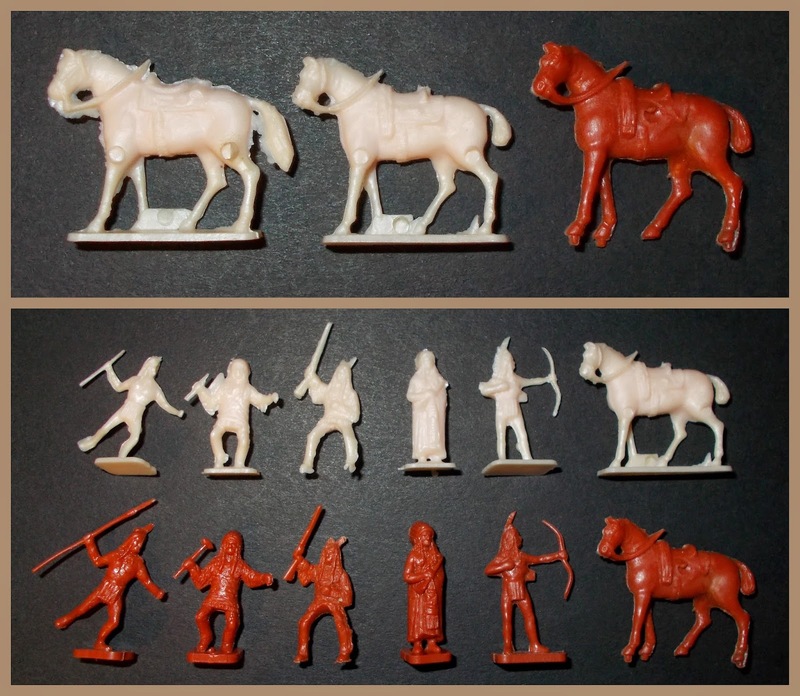 The sets actually had a further set of US cavalry included, missing from this catalogue illustration. Here we see the full set, near mint; the box had some scuffing. No Cowboys, although they remained in the blurb for the longest time, what you actually got was a set of Indians, with the Wagon Train and US Cavalry. 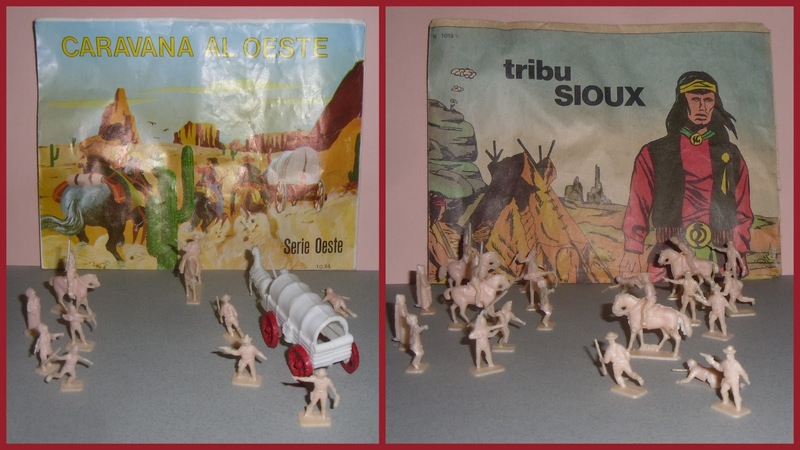 My suspicion is that either the set was going to have Indians and Wagon Train (as per the illustration) or Cavalry and Indians, and equally sensible pairing which would conform to the two figure-set rule of the other playsets, but that someone realised this would leave no (cavalry) or very few (wagon train) people to man the beautifully modelled walkways of the fort. 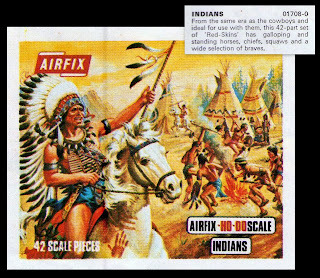 While a solution was sort, the blurb was allowed to mention the Cowboys as a possible, because the catalogue artwork had a tighter time-pressure than the set itself. That blurb then became the default blurb in the catalogue/s every year, while the conversation about what to do probably covered a set of foot cavalry being developed and/or using the Union Infantry (or Cowboys) and/or other scenarios that ended with the compromise of including the Cavalry, and hoping a few settlers could populate the walkways? 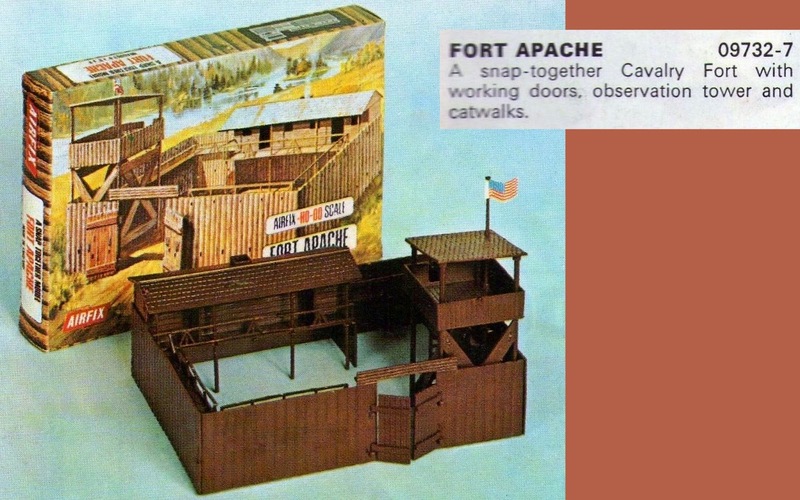 The bare fort was also available as Fort Apache if you already had enough figures (or a tighter budget! ), note how the artwork is a reversed image of the finished fort. Marx by Marksmen via Rado Industries (Ri-Toys), despite being among the smaller of the figures from Marx, these still amnage to dwarf the Airfix offering, but not by much and a bit of paint and scenery could have them working well together. My Egyptian heavy-armoured column (there were three of these!) - following the principles of Terry Wise's school of converting. Ignoring the Napoleonic horse-furniture and wheels, I took a craft knife to the RHA limber, cut the feathers off the archers and added a cartridge-paper body to make chariots! Scan of old photograph.